Trees play a vital role in the environment, the ecosystem, conservation, and to all living creatures and humans on this planet. Arbor Day, celebrated as a national holiday, stresses the significance of preserving existing trees, of replacing diseased, rotted, and dead trees, and of planting new trees. 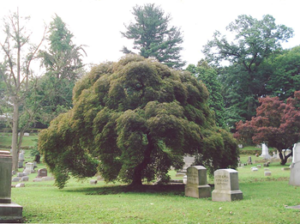 The multitude and variety of the trees and shrubs at the Charles Baber Cemetery are a unique feature that sets it apart from many other cemeteries in the county. The cemetery was opened for burials over 150 years ago on partially forested land. Many of these trees are now in the decline of their life with trunk and branch damage, rot, or disease. 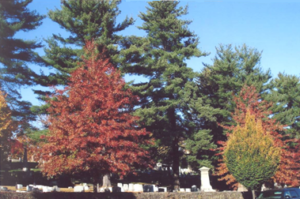 It was through the concern for the damaged and dead trees along Market Street that a tree replacement program was created in 1999 to remove dead, diseased, and rotted trees each year on the cemetery property, and to replace them with newly planted trees. The trees that are seen along Market Street, at the 16th Street entrance and fence line, and throughout the grounds of the cemetery are absolutely magnificent. The cemetery acreage contains a wide variety of trees and shrubs with an unusually large concentration of Maples. In fact, it may contain the largest concentration of Maples than any other equal size land mass in the state. There is a large number of ‘red sunset’ red maples along the main road from the chapel to the 16th Street entrance, Japanese dwarf maples and regular red maples dotted throughout the properly, sugar maples to the east of the pond, and sycamore maples by the chapel. Some trees change with the seasons as their barren limbs shed the white cloak of winter and they take on the colorful and budding blossoms of spring, and then the deep and varied greens of summer, and then close their cycle in the brilliant golds, reds, oranges, and yellows of autumn. And of course most easily seen over the winter months when the deciduous have lost their leaves, we have the stately evergreens and the arborvitae situated in the northeastern part of the cemetery and dotted periodically throughout the grounds. Day tree replacement program, a description and picture of each type of tree found on the property is presented on this website. Also each tree is plotted on a map of the property which is divided into four sections. Click on a type of tree below to learn more!